Feel free to browse these Frequently Asked Questions about the basics of growing Haskap berries. Feel free to post questions and one of the volunteer members will answer your question. Haskap is the Japanese name for Lonicera caerulea, also known as Edible Blue Honeysuckle, Honeyberry and . Haskap is an ancient Japanese name of the Ainu people of Northern Japan for the fruit meaning “berry of long life and good vision”. The first introduction of the cultivated plant to Canada was at Beaver Lodge, AB in the 1950s. The fruit was bitter and not palatable. It has been found in the wild in every province in Canada except for British Columbia. The name “Haskap” was chosen as the brand name that have been applied to new varieties bred by the Fruit Program at the University of Saskatchewan, Saskatoon, Saskatchewan, Canada. Haskap berries come from varieties common to a circumpolar species native to northern boreal forests in Asia, Europe, and North America. It is mainly found in low lying wet areas or high in mountains, in a variety of soil and growing conditions. Most people mistaken the fruit as part of the Vaccinium Family (Blueberries and cranberries), when in fact the fruit is just as closely related to tomatoes. It comes from the Dipsacales Order and is related to the Snowberry and Elderberry. What Do Haskap Berries Taste Like? Haskap have their own unique taste, color and texture. They have very tiny seeds that can be eaten with the berry. The taste has been described as tart/sweet and juicy, like a raspberry. They have a powdery blue skin, like a blueberry but the skin is quite thin and melts in your mouth. How do Haskap berries grow? Haskap berries grow on bushes that form a globe shape and can grow 5-7 feet tall over 5-7 years. commercial harvesting occurs in the last weeks of June and into late July, depending on the geographical region. What pests or problems are associated with Haskap? Haskap have few known pests. By far, birds have been the most challenging as they will come in large flocks and decimate bushes ripe with berries. For orchard growers, bird sound / calling devices have been successful to keep small birds away. For gardeners and small orchards, netting and scarecrow type of set-ups are often necessary and have been used successfully. Does not compete with grasses and weeds once established. Grass is good between rows. The University of Saskatchewan varieties are winter cold hardy to -45C, and flowers have been known to survive and set fruit after withstanding -11C temperatures. Haskap is being planted across Canada, the United States, many eastern European Countries, Japan, Russia, Chile and Australia to name a few of the many countries becoming interested in the Haskap berry. Growers in Alaska, Yukon and the Northwest Territories find the Haskap varieties very suited to their short season with long daylight hours. What is the plant structure? The fruit is an oblong dusty electric-indigo coloured berry about 1 cm diameter and ranging from about 1 – 4 cm long. What is a pollinator and why do Haskap need them? All varieties of Haskap or edible blue honeyberry need a pollinizer type of berry bush in order to have optimum berry growth. As a general rule of thumb, you need one pollinizer plant for every 5 plants to be pollinated. It is best if the plants are planted side by side, but as long as bees can easily see both plants at the same time they are probably close enough. Picking a pollinizer plant can sometimes be a bit tricky as not all varieties of Haskap will pollinate each other. See this article by Dr. Bob Bors to learn more. Haskap flowers are self-incompatible and a second compatible (pollinizer) plant is needed for fruit to produce from the flowers. Bees and insects carry the pollen from one flower to another. As a general rule of thumb, you need one pollinizer plant for every 5 plants. It is best if the plants are planted side by side, but as long as bees can easily see both plants at the same time they are probably close enough. What is pollination and why does it matter to Haskap berry production? The word pollinator is often used when pollenizer is more precise. A pollinator is the biotic agent that moves the pollen, such as bees, moths, bats, and birds. Bees are thus often referred to as ‘pollinating insects’. Insect pollinators include bees, (honey bees, solitary species, bumblebees); pollen wasps (Masarinae); ants; flies including bee flies, hoverflies and mosquitoes; lepidopterans, both butterflies and moths; and flower beetles. Vertebrates, mainly bats and birds, but also some non-bat mammals (monkeys, lemurs, possums, rodents) and some lizards pollinate certain plants. Among the pollinating birds are hummingbirds, honeyeaters and sunbirds with long beaks; they pollinate a number of deep-throated flowers. What Haskap varieties are pollinizers? Currently, there are 9 varieties being branded as Haskap in Canada. All of these varieties have come from the University of Saskatchewan Fruit Breeding Program. 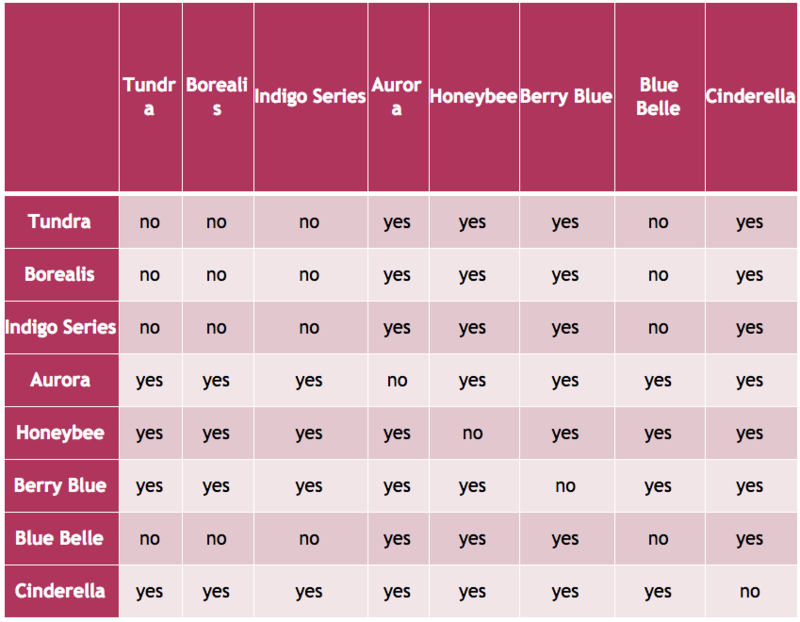 The following is a chart that shows the pollination combinations of Haskap varieties. How are the different varieties described? 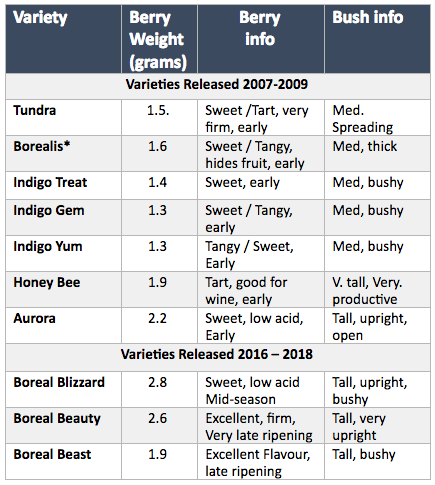 The Indigo series varieties were initially released for testing alongside ‘Borealis’ and ‘Tundra’ with the numeric labels shown. The Haskap variety released by the University of Saskatchewan to propagators in 2012. The University of Saskatchewan has announced the release of new Haskap selections. Larger in size and mid-to-late season, these berries can hold the potential for bountiful fruit production throughout the summer. These new varieties will be available in the following years. These are heavier than Tundra and the Indigo series but not as heavy as ‘Boreal Blizzard’ or ‘Boreal Beauty’. ‘Boreal Beast’ was so named to help people remember that ‘Beauty and the Beast’ belong together for cross pollination. How many varieties of Haskap are there? The main issue with warmer climates is that the plants come out of dormancy too early in the spring. What fertilizer and watering regiment should I follow? How are the bushes planted? What kind of harvesters are used to pick Haskap berries? How are Haskap bushes pruned? Pruning should be undertaken in late winter or early spring. You should mainly thin out older branches when the bush gets too dense. Never remove more that 25% of a bush in any year. Haskap does not sucker so you won’t have to worry about that. If mechanically harvesting may need to prune lower branches to train bush to grow upright. What kind of Haskap products are there? Haskap makes great wine, spirits/liqueurs, juice, jam, spreads, tarts, chutneys and relishes, ice cream, yogurt, dried berries and powdered berry mixes.